The following report is from Bob Miller, pastor of Grace Covenant Fellowship, GCI’s Birmingham, AL, congregation. Like most GCI congregations, we were small—averaging 15-20 in attendance—and praying for guidance to see how God wanted to use us. We were getting older and “church planting” seemed beyond our present gift mix, as well as beyond the level of energy required. Like most churches our size we were rocking along, meeting in our “holy huddle” each week and faithfully doing what we could in terms of outreach ministry and supporting our denomination. But a welcome change came along—an “open door” to do something completely different. That conversation took place in November 2015. We had been paying $750 a month in rent at another church. Since we would be providing a service for them, we would not have to pay any rent! So we bought an electric keyboard and speakers—basic things we would need. We also purchased a fold-up table-top lectern, which would work well. The activity room where we meet for church had tables and chairs, and we are allowed to store the equipment we bought in the activity room closet. We held our first church service there in December 2015 from 10:30 – 11:15 am. It’s very casual as some who attend come in wheelchairs or are on walkers. Some are full-time residents and others are there for a few weeks recovering from strokes, heart attacks, surgeries, etc. They are mostly older folks—like us, so we can relate. We usually open the service with two hymns, then have intercessory prayer, a reading of an inspirational poem by our 91-year-old member, another hymn, scripture reading, a 20 min sermon, closing hymn and prayer. We are blessed to have a young woman who does beautiful PowerPoint graphics for the hymns and sermons. We now have about double our attendance (33 this past Sunday). Often family members come with the patients, so we are privileged to serve them as well. The folks seem to love having the scriptures up on the screen, so they can follow along. We stay seated while singing so that those in wheelchairs can still see. This past Sunday we had communion, and they appreciate being able to participate in that. The feedback from the patients and their families has been incredibly encouraging. We have had folks from a variety of denominations—Catholic, Methodist, Episcopal, Baptist, you name it! Since the first of this year we have had about 140 first-time visitors! One family member was so inspired by what we were doing that he sent us a check for $500! We do not take up an offering, but we have a basket out on the table where our members bring their donations and occasionally guests will give a little. But we don’t want them to think we’re after their money. We view what we are doing as an outreach ministry. Our small congregation “came to life” in serving others. Their attendance became more regular! It’s wonderful not to have to pay rent or maintain a building! We continue to do what we were doing before, such as our annual shoebox ministry, supporting other charities and denominational ministries. We did have to discontinue our discipleship class that we were having prior to worship, but the benefit of serving others far outweighs that small sacrifice. Our members connect with the visitors and some of them become “regulars” who are with us from week to week. It’s something like a “parachurch” type ministry, and I think that many of our smaller churches might be able to do something like this. It’s different, of course, from planting a new church with the anticipation of growing a local church congregation. But when you see how these folks appreciate the chance to worship the God they love, it feels very rewarding. The need is great, because these rehab centers and assisted living facilities are popping up all over. At least they are in the Birmingham area. We use primarily well-known hymns, because these folks love them. I think it’s important to know your audience and what makes a worshipful experience for them. We use some praise songs, also, but try to choose songs people can sing easily. We have our electric keyboard and a bass guitar for accompaniment, and it works beautifully. We’ve had some interesting experiences. One guest had been a gospel singer and asked to sing for us. One lady asked to sing and sang a capella beautifully. We love being able to share the good news with new folks every week! Thanks so much for sharing with us this most encouraging community outreach. It serves to show that there are no limits to Spirit inspired creativity when it comes to being and/or becoming a missional church. Offering spiritual support to His „little children“, as you are doing, mirrors beautifully the example given to us by Jesus, the Healer of both body and soul. May God continue to magnify your ministry. God for us, with us, and through us. How encouraging! Thanks for sharing, Bob and Ruth. Bob, thank you for sharing your congregation’s experience. Our congregation is much like yours: small and members of older age. But our members (like yours) are still active to the degree their energy allows, and they want to be involved in “kingdom work.” The story of your people’s attitude of service is inspiring to other similar congregations. It shows there are many configurations that lead to “success” as a congregation. God’s wonders never cease. All kind of “churches….”. Where the need exists, God provides an open door. Bob and Ruth, what an inspirational story! We rejoice over how the Holy Spirit has led your congregation. God bless you all. We have a mixed congregation of people from newborn to senior citizens with a few elderly and disabled citizens accompanied by a caregiver or a friend or relative. I am in this category. Our congregation was started by a local farmer’s suggestion along with several friends and neighbors of several different faiths as well. A building committee was formed, then a building fund was created. After enough was collected, the construction began. When it was completed, we had a congregation of 98. It is now several years later, and we now have quite a larger congregation and have recently began thinking about doubling the size of our building. There are activities for everyone, no matter how old or young the individual may be. There is even a puppet show for the kids that teaches things about Biblical heroes and how God intervened in their lives, plus examples about how we all need to treat others, etc. Plus we have an annual picnic, a choir, special music, holiday treats for the kids, a sanctuary for the homeless in the winter, a free meal for the poor who have nobody to celebrate Thanksgiving with, and even gifts for the shut-ins like myself for Christmas. Our pastor sets a fantastic example for us all, and feeds us the Spiritual food we need through His sermons, and his guidance. No gossip or division is tolerated, and we even have a weekly Bible study. I love him and the members of our congregation. They are definitely my Spiritual brothers and sisters, and I look forward to every opportunity I get to be with them, celebrating the love of Christ with one another. Oh, what an inspiring and exciting testimony of God’s move in your fellowship there. I pray blessings and continued life-changing relationships formed going forward. Hi, in Birmingham!! What an idea. I’m going to mention it next services.From Ontario, Ernie. DEAR BOB AND RUTH MILLER , KEEP UP THE GOOD WORK YOU ARE DOING IN SHARING THE LOVE OF JESUS , GOD CAN USE ALL THE PARTS OF HIS BODY AS YOU ARE PROVING . GOD BLESS FROM Trevor Coverdale NORTH LONDON CHURCH ENGLAND . 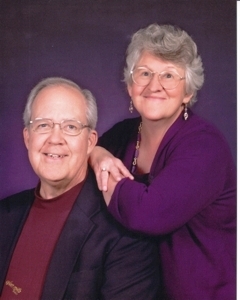 Bob and Ruth – well done, clearly you are following the prompting of the Holy Spirit. Your outreach and service are a wonderful blessing to your congregation!